Farming Friends & TopVeg have collaborated to create a How To Grow Thyme card. The card may be pinned to the potting shed wall as a useful reference on how to grow thyme. We hope all vegetable gardeners will find the growing card useful, as thyme is a great herb for the vegetable garden and useful in the kitchen. 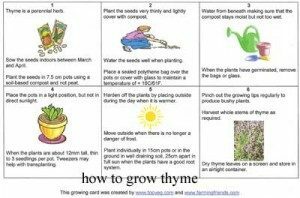 If you would like a pdf of the grow card for How to Grow Thyme, please contact us asking for the grow card for thyme and we will email it to you. Thyme is included in the How to Grow Culinary Herbs ebook written by TopVeg & Farming Friends which costs £4.